The story of Oishii began in the summer of 2006 when Ciara Troy founded Oishii Foods fresh out of college. Inspired by her time studying Japanese business & language in Tokyo as part of her BESS degree from Trinity College Dublin, Ciara wanted to share her love of Japanese Food with a wider audience! The name ‘Oishii’ meaning delicious in Japanese seemed a fitting description of what Ciara wanted her food offerings to be: fresh, healthy and above all….Oishii! And so, from her domestic kitchen, Oishii Foods was born. 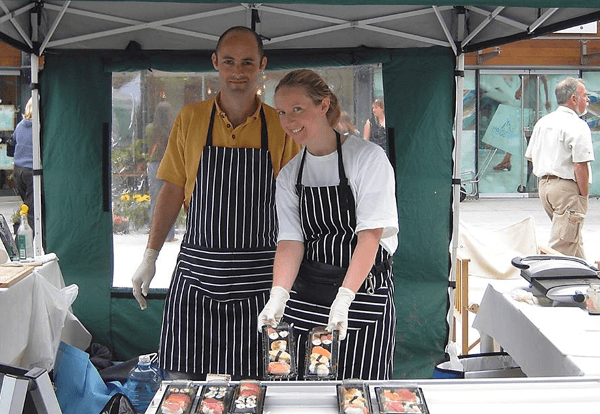 On 22nd July 2006 Ciara began trading at her first farmer͛s market in Greystones with a variety of Japanese dishes: gyoza dumplings, yakitori & a range of handmade sushi. The reaction from customers was so positive and the freshly made sushi trays were definitely a winner! Ciara had to focus on the sushi offerings and making enough of it to satisfy the growing demand at Farmers Markets around Dublin. From making all of the food in a domestic kitchen, Ciara moved into her first small commercial kitchen in order to grow the business after 6 months. With interest expressed from some retail stores, Ciara bought some barcodes & label paper for the home office printer and set about selling sushi in stores! The labelling was basic, cut into strips using a sharp Stanley knife, but it was a start and did the job! Most importantly the products tasted great and it wasn’t long before more shops came on board. Sushi is pretty labour intensive to make and it reached the point where the business had grown but all the money was going straight back in. A successful funding application to the Wicklow County Enterprise Board and support from the bank allowed Ciara to invest in some capital equipment to help the business become more cost effective, without compromising on product quality or the artisan nature of the food. With listings coming on board from Superquinn & then BWG, the business quickly outgrew the small kitchen inKilcoole. It had reached the point where there was no more fridge space and we had to plug in the fridge van through the letter box!! Oishii Foods was relocated to a larger unit in Bray where business continued to grow with new & bigger accounts such as Tesco & Dunnes Stores coming on board as well as more independent shops. In 2012, Ciara heard of a unit in the central location of Smithfield that would be larger and more suitable logistically. Another funding application was submitted to Dublin City Enterprise and thankfully this was accepted and supported by the bank. Ciara project managed a complete fit out of the empty unit which was no mean feat and eventually the whole team moved in June 2012 to its current location of 1, Oxmantown Lane, Smithfield, Dublin 7! From Smithfield, Oishii Foods has been in a strong position to pursue new business over since 2012, Ciara & her team have built a strong brand presence in the retail food to go space. New foodservice accounts have also come on board and customers still have the opportunity to order freshly made sushi platters for private parties, office & conference events. Other activities also include team building events and hands on sushi making demonstrations – these are fun & informative activities which Oishii can host in both private & corporate settings. Please visit our ‘Contact Us’ page for more enquiries. Then in 2015, Ciara set up the first Oishii Sushi kiosk within Mortons on Hatch St, Dublin 2. This was an exciting project & Ciara was very happy to be working with Mortons on such a venture. The concept of ‘rolled today, sold today’ represents the best of what Oishii stands for in terms of freshness, healthy & delicious food inspired by Japan! An opportunity to ‘once again make sushi to order was like a return to her roots‘, according to Ciara. Also available is the facility to order online & then collect your freshly made sushi at Mortons Hatch Street. There have been many ups and downs over the last few years, a roller coaster if ever there was one. But whathas remained a common thread since the very beginning is Ciara’s dedication to making fresh, high quality food, gaining inspiration from Japan and also from South East Asia. From very humble beginnings the business has grown to employ 16 people, and supplies over 120 outlets around Ireland, with the majority of shops being Dublin based. Oishii Sushi is available in select outlets of Tesco, Dunnes Stores, Spar, Eurospar, Centra, Super Valu, Londis, Insomnia, Applegreen & Topaz service stations as well as numerous independent shops like Mortons, Nolans of Clontarf & Cavistons to name but a few.